WASHINGTON (Reuters) – A national security panel that can stop mergers that could harm U.S. security has begun looking at Singapore-based chipmaker Broadcom Ltd’s plan to take over rival Qualcomm Inc, according to three sources familiar with the matter. Tesla has started inviting some Model 3 reservation holders who aren’t already part of the Tesla family to configure and order their cars. The company says the cars will be delivered four weeks after the orders are placed. The first of these invitations, as reported by the Wall Street Journal, went out last Thursday. They’re a positive sign after months of bottlenecks that have left Tesla well behind its production targets for the new mid-priced electric sedan. The first wave of Model 3s went to employees — who received the cars from a Model 3 launch event last July — and customers who have already bought a Model S or other Tesla car. Plenty of customers who placed a $1,000 deposit on a Model 3 still have a long wait ahead of them, though. Tesla has accepted around a half million reservations for the car. The company has revised its target date for producing 5,000 of the cars per week, which it now hopes to accomplish by the middle of this year. But even that only adds up to about 250,000 cars per year — so buyers at the tail end of that 500,000-reservation line could be waiting well into 2020 to get their car. Plenty of would-be customers are already frustrated, in part because the delay could deprive some of them of a $7,500 tax credit. There’s also a growing number of competing electric car options, including the Nissan Leaf, which could benefit from Model 3 frustration. Steve Jobs is now remembered as the visionary and fastidious cofounder of Apple, and creator of world-changing innovations like the Mac and iPhone. But when he was 18, he seems to have been a typically indifferent — maybe even lazy — teenager. That, at least, is a possible takeaway from looking at a new document going to auction soon, and highlighted Sunday by Inc. It’s a job application, completed by Jobs in 1973, three years before he and Steve Wozniak founded Apple. Jobs had recently dropped out of Reed College, but was still hanging around auditing classes. The one-page application, which Inc. says might have been used for campus positions, provides comically little that would have been useful to anyone looking to fill a job. For his address, Jobs simply wrote “reed college” (yes, in lowercase), and he left “Past Employment” entirely blank. In short, the application doesn’t scream “future industrial giant.” And even someone who might have wanted to hire the young Jobs would have had a heck of a time finding him. Jobs was a bit more thorough in describing his skills and ambitions, though, specifying an interest in “design, tech” under a computing skills item. Under “Special Abilities,” he elaborated that his included “electronics tech or design engineer. digital. – from Bay near Hewitt-Packard.” Ah yes, the well-known Hewitt-Packard. So your organization has a big vision and uses that vision as the North Star for guiding strategic decisions. But when you’re only deploying against vision with no data to back it up, you’re flying blind. This is where business intelligence (BI) comes in. There are many definitions for BI, but in a nutshell it’s an architecture and set of integrated technologies, methodologies and processes that translate raw data into meaningful, useful information. And this output is used to enable more effective strategic decision making and planning to guide the organization. BI is not new. In fact, it dates back to 1865 when the phrase was first introduced in the “Cyclopedia of Commercial and Business Anecdotes” in an article about a banker who gathered information and acted on it before his competition could and realized a profit. And in 1958, IBM computer scientist Hans Peter wrote a revolutionary article “A Business Intelligence System” that described an automatic system for disseminating information to the various sections of an organization. Today, organizations are using it for the same purposes: forecasting, predicting future customer behavior, improving strategies, identifying new opportunities, searching for hidden patterns, etc. What’s changed is we have tools that now provide deeper data insights. With BI you’re able to see what happened, what is currently happening in real time, why, predict what will happen in the future, and better identify how to direct or reshape the outcome (what you want to have happen). In essence, BI empowers fact-based decision making. It also helps ensure everyone on your team –from the C-suite to the sales team and operations to finance –is operating from a single source of truth. That is, rather than having sales using one system, set of tools and rules, and marketing having a completely different set, everyone has insight into the same data sets and information. It aligns decision making across the entire organization. Which customer should we target, when, where and why? What caused the dip in our lead generation last month? What is the most profitable source of sales leads and what elements have impacted that source traditionally? Where does our efficiency ratio drop and how is it impacting our operations? You’ll also be able to more accurately identify whether that new product or service is worth the risk of launching, when is the best time to launch it and into which market, what the cost should be, etc. BI can, and should, be used across the entire business to make more informed decisions. Traditionally, there have been five stages of BI: Data sourcing, data analysis, situation awareness, risk analysis, and decision support. Data sources — gathering information from multiple data sources such as relational databases, analytic databases, and business applications like customer relationship management (CRM) platforms or enterprise resource planning (ERP) software, to name a few. Data analysis — the data collected from these sources is only useful if you can synthesize it from the various sources and derive meaning from it. This is where you take the information and turn it into knowledge. Situation awareness — how you put context around the data. It’s observing and understanding the implications of what’s going on around you and forces that may be at play. Risk analysis — this is where you take what you know (the data – information – knowledge) and utilize it to assess current and future risk, costs and benefits of taking one action versus another. It’s assessing risk versus reward. Decision support — identify and select intelligent decisions and strategies. Some also refer to this as the presentation layer, which are the dashboards, reports and alerts used to present the findings from the analysis. At our agency, we’ve further distilled this down to four. We like to think of business intelligence as a systematic combination of reporting, analytics, intelligence, and strategy. Reporting — what do we see? Analytics —what does it mean to us? It’s translating what you see into terms that relate to your business. Intelligence — what do we do? In other words, what do we do about what we’ve uncovered? How do we put the data into action? Strategy — what is the outcome we want to achieve? Strategy acts as a filter to ensure you’re not just seeing what you want to see, but what’s actually there and use that to guide next steps. BI gives organizations the ability to gain access to focused analysis at a scale, complexity and speed not easily achievable with traditional operational reporting or spreadsheet analysis. It allows you to go layers deeper, to look at what could be influencing the changes in your business, and even stay one step ahead of those potential changes to mitigate risk. It’s almost Tax Day, which also means it’s peak tax fraud season. The Internal Revenue Service has played some epic games of cat-and-mouse with phone and online scammers over the past 10 years, but the latest scamming trend for 2018 has a particularly devious twist. Here’s how it works: Attackers use a taxpayer’s stolen identity information to fraudulently file their returns for a refund. They allow that refund to direct deposit into the victim’s actual bank account. Then the real fun starts. The scammers—posing as the IRS—call the victim, demanding that they return the wrongfully allocated refunds. Since the victim presumably hasn’t yet filed their own taxes, it’s easy for them to assume a mistake was made—and send their money to the crook. That’s right. They give you the money, and hope they can trick you into voluntarily passing it along to them. Scammers steal the personal information to file for refunds from tax preparers, accounting firms, corporate data breaches, and other identity-theft schemes. The IRS first warned tax professionals about the rise of the new “erroneous refunds” scam at the beginning of February, and released a followup alert for the general public last week. So far victims have been hit by at least two different versions of the hustle. In one, attackers pretend to be debt collection agents contracted by the IRS to recover fraudulent or mistakenly issued refunds. They instruct the victim how to repay the money to the “collection agency,” and capitalize on the perceived urgency of receiving a call from a collection bureau. 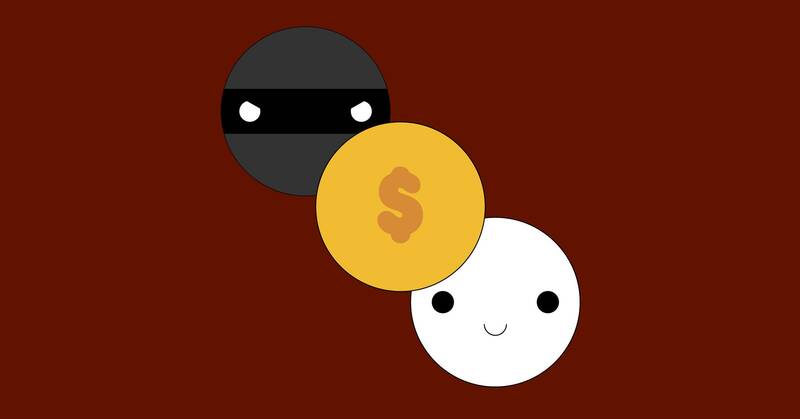 In the other scenario, victims receive an automated call claiming to be from the IRS, in which a voice recording claims that the victim could be charged with fraud and arrested for failing to return the money. The recordings also threaten that the victim’s Social Security numbers will be “blacklisted,” whatever that means. Finally, the recording shares a case number and phone number for the victim to call to “return” the erroneous refund. As with other types of tax scams, the crucial thing to remember is that the IRS will basically never call you on the phone, and certainly not to demand payment. A call to discuss taxes owed would always be preceded by multiple paper bills, and the opportunity to appeal the amount owed. The IRS also never requires one specific payment method, and doesn’t ask for credit/debit card numbers on the phone. Finally, the bureau never threatens to bring in law enforcement during a phone conversation. Knowing that should help people discredit virtually all IRS phone scams. If you do receive an erroneous refund, threatening calls are “not an approach that the IRS would take” to resolving the situation, Barreda says. “If you get a call, hang up and always contact the IRS directly and verify what your tax situation is,” she adds. Your bank can return a direct deposit to the IRS while you contact the bureau to explain the reimbursement, and potentially initiate identity theft protections. Analysts see at least some good in these scam evolutions, because they mean that the steps the IRS has taken to reduce fraud are working, forcing criminals to find new hustles. Then again, that’s not so reassuring for the millions of taxpayers at risk of facing these threats head on. After radical swings in the stock price of Nvidia Corp. (NASDAQ:NVDA), which included a rapid 18% drop, investors can examine the causes of this volatility to form a view of prospects for the stock over coming months. This author believes that more growth may be expected in the price of Nvidia shares. Investors saw a pronounced drop in Nvidia before an outstanding full-year’s earnings report. Thereafter the stock entered a very volatile range. That volatility continues and is to date more than double that of the weeks before the marked fall, and is greater than at any time in more than a year. For example, on February 21 Nvidia fell more than $10.00 (4.00%) as the stock exemplifies high beta. 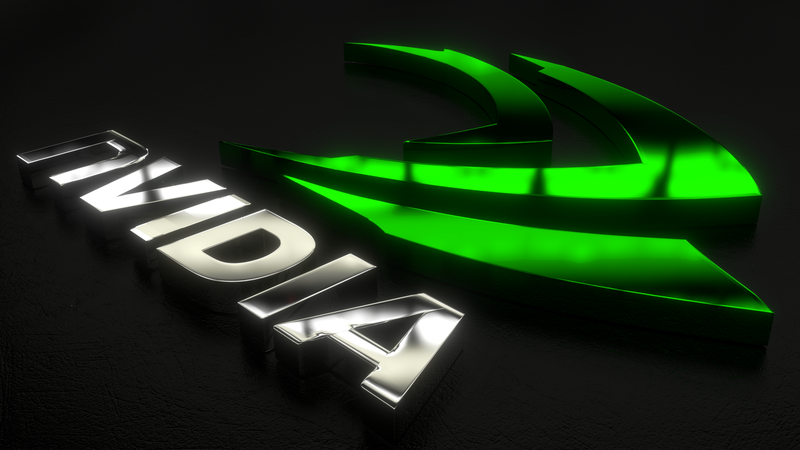 To compare with its competitors, Nvidia registers a beta of 1.87, while Advanced Micro Devices, Inc. (NASDAQ:AMD) shows 1.58, and Intel Corp. (NASDAQ:INTC) has a beta of 1.41. Whenever beta becomes elevated, that is a time for investors to exercise increased vigilance as it may presage transitions, trend reversals and fake-outs. In light of continuing volatility persisting after announcement of earnings outperformance, understanding the cause of the drop and its volatile aftermath should aid investors in reconciling these contradictions to determine the future direction of the stock. 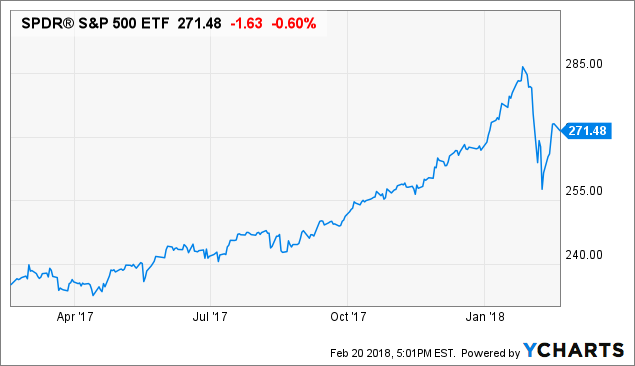 Between January 21, 2018 and February 6, Nvidia fell precipitously by $45.27 (18.16%) to lose in just four trading days what it had taken nearly one month to gain. During such rapid market moves, valuation offers no protection. Then on February 8 the company announced that 2018 financial year profit grew by 83%, revenue climbed nearly 41%, and gross margin grew by 110 basis points. This outperformance has now taken the stock beyond previous highs, yet heightened volatility persists and may trouble holders. The 18.16% fall in price was caused mainly by technical market factors, not fundamental considerations particular to Nvidia. Approximately 85% of the total volume of stock market trades are based on algorithmic or quant criteria, and consequently by virtue of that sheer volume of technical trading, markets often rise and fall around technical trigger points. 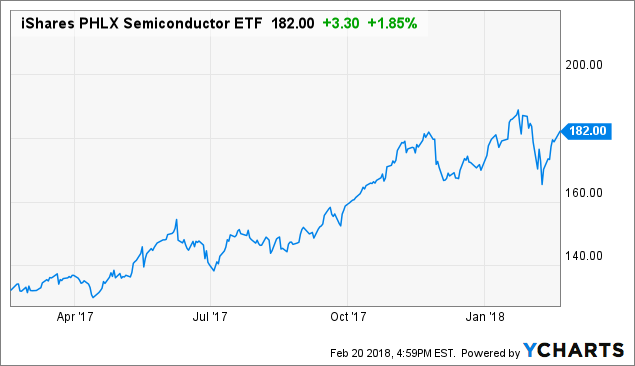 Underscoring this prominence of technical considerations is the correlation that the fall in Nvidia stock had with the drop in both the semiconductor sector as a whole and in the entire stock market. Compare the similarity in the charts below of both the semiconductor sector and the S&P 500 with that of Nvidia above. As regards the overall stock market, a significant technical element on this occasion was the volume of short volatility trades using instruments tied to volatility indexes like the VIX. As a result of the power of market correlation, the downdraft in the stock market as a whole depressed stock prices in the semiconductor sector and pulled Nvidia down. It is driven by technicals, not fundamentals. The ongoing market correction doesn’t reflect a worsening of economic and corporate fundamentals. Rather, it is being driven by technical factors, including the unwinding of “short-volatility” trades . . . the testing of relatively new products and a shift in investor conditioning away from the “buy-the-dip” paradigm. Continuing volatility in Nvidia’s stock is in significant part due to concerns in some quarters regarding Nvidia’s exposure to cryptocurrency demand, as there are factors at play which may cause that demand to weaken in the foreseeable future. Cryptos generate approximately 10% of the company’s revenue, compared to approximately 3% of revenue for rival Advanced Micro Devices, Inc. (NASDAQ:AMD). The future evolution of cryptocurrencies, especially Ethereum, threatens to render mining less profitable as it diminishes the block reward and reduces the difficulty of algorithms. In areas characterized by high energy costs, the profitability of mining is also waning. A mooted move to proof of stake settlement would reduce the need for mining. 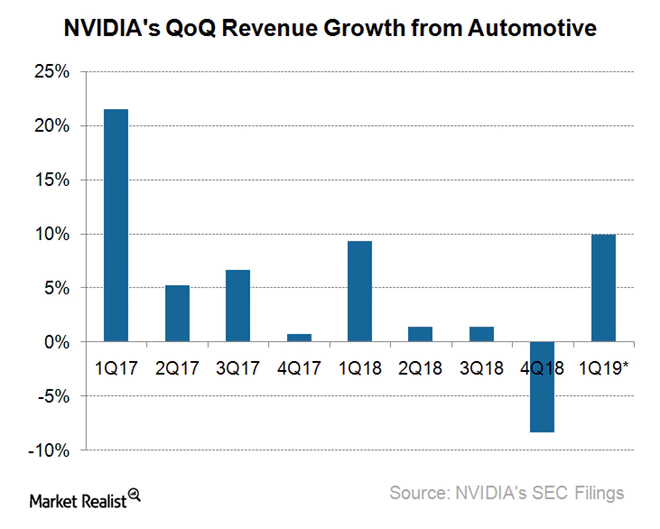 To be considered additionally, Nvidia’s switch from in-car entertainment systems to AI driving systems is demonstrating lower than anticipated cash flow from the automotive segment. In the fourth quarter, automotive income grew 3% year-on-year, while falling 8% sequentially. However, 1Q19 automotive revenue is projected to climb above 1Q18 levels. This market promises much increased revenue from approximately 2020 when mass market car manufacturers are expected to launch their first wave of autonomous vehicles. Nvidia is to launch the world’s first autonomous driving processor, named Drive Xavier, constructed with more than 9 billion transistors in the first quarter of 2019. Nvidia’s road to a sizable share of the autonomous driving market will be based on its alliances with Volkswagen, Uber, Mercedes-Benz, Baidu Inc. (NASDAQ:BIDU) and China’s ZF among others. While there are valid concerns as discussed above, it may be expected that Nvidia’s increasing revenue derived from the cloud enterprise segment with their Volta chips, with capital expenditure in this market rising annually at a rate of 20-30%, will more than compensate for any reductions in cryptocurrency or auto market revenue. To underscore this point, Nvidia’s sequential growth in data center revenue exceeds 20%. 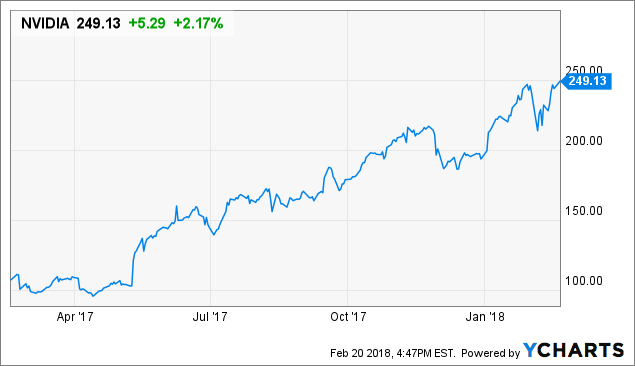 A further growth area for Nvidia promising markedly increased earnings is that of AI inference applications and the IoT as these markets, presently in their infancy, evolve exponentially. Nvidia’s financial base is healthy and growing, forming a foundation for projecting a continuing rise in share price. Sales growth in financial year 2018 was 40.58% year-on-year. The cost of sales in the same period grew at a slower rate than sales revenue, while EBITDA in 2018 was $3.41 billion compared to $2.16 billion in 2017. Total assets rose to $11.24 billion in 2018 from $9.84 billion in 2017, and total liabilities fell from $4.08 billion to $3.77 billion in the same period. The drag on net income of Nvidia’s transition away from in-car entertainment towards AI driving systems, with their inherent cash flow lag, has been minimal with net income rising in 2018 to $3.05 billion from $1.67 billion in 2017. Free cash flow rose in 2018 to $2.91 billion from $1.5 billion the previous year. After a jolting fall in share price, which can largely be attributed to technical factors, the full year’s earnings report has led Nvidia stock into a very volatile period with heightened beta relative to its peers. However, this phase promises to resolve into a continued upward trend as a result of growing demand in the enterprise segment. Concerns about a downturn in cryptocurrency revenue or lag time in realizing a higher volume of auto revenue are unlikely to halt that uptrend. Consider following this author. To receive immediate alerts upon publication of future articles by this author, please click on either of the “Follow” buttons at the top and bottom of this page, and then select “Real Time Alerts.” To review previously published articles by The Structure Of Price, click on the author’s name at the top of this page. Breakthrough innovation is the dream of every entrepreneur, but it’s still a scarce commodity. Selecting and nurturing people who are likely to help you in this regard is an even more elusive capability, and one that every angel investor, like myself, wishes he could get a lock on. In fact, every manager and business owner needs this skill just to survive with today’s pace of change. We all wish we were the next Steve Jobs, or Elon Musk, or Thomas Edison. If we’re not, then at least we would like to recognize them when they come through the door, or better yet, create a few like them in our own organization. I wish I understood what makes some people so spectacularly innovative, producing triumph after triumph, while the rest of us merely get by. I’ve seen a lot of speculation on this challenge over the years, but I was recently impressed with the insights in a new book, Quirky, by Melissa A. Schilling. From her position as professor at NYU Stern, and recognition as one of the world’s leading experts on innovation, she takes a deep dive into the lives and foibles of eight well-known innovators, including the ones mentioned. One of her encouraging conclusions is that we all have potential in this regard, which can be brought out naturally by life circumstances and special circumstances, or nurtured by the people and culture around us. 1. Incentivize people to challenge norms and accepted constraints. It also means giving people opportunities in areas they have interest, but no track record. Elon Musk, for example, had no experience or training as a rocket scientist when he came up with the idea of reusing rockets, and the innovative idea for SpaceX. 2. Give people time to think beyond current job assignments. When you are looking for breakthroughs, you need time to think outside the box without fear of consequences. Make it clear, as they do at Google, that you are expected to spend some “20 percent time” outside your current job assignment. The payoff value of a person working alone on side projects, tapping into intrinsic motivation, has been the source of several of Google’s most famous products, including Gmail. 3. Reinforce people’s belief in their ability to succeed. One of the most powerful ways to increase creativity, at both the individual and organizational level, is to encourage people to take risks by lowering the price of failure, and even celebrating bold-but-intelligent failures. Also, creating near-term project milestones, with plenty of opportunities to celebrate early progress, is extremely valuable to reinforce people’s belief in their ability. 4. Inspire ambitions by setting grand goals and purpose. Driving business goals that have a social component that people can embrace as improving quality of life provides intrinsic motivation to increase creativity and effort in their activities. Steve Jobs was obsessed with revolutionizing personal expression, more than making a computer. 5. Tap into people’s natural interests and favorite activities. In business, this is called finding the flow. It requires both self-awareness on what you like to do, and a willingness on the part of your manager to personalize work assignments. With most jobs, there are many ways to get to results, so let your employees tell you what steps and tools they prefer. Thomas Edison loved to solve problems and he designed his own experiments. Thus he was happy to persevere, despite 10,000 of his light bulb filament material tests that didn’t work. 6. Increase focus on technological and intellectual resources. With today’s pervasive access to the Internet, with powerful search tools from Google, WolframAlpha, and many others, the Library of Congress is at everyone’s fingertips. They just need the inspiration, time, and training to capitalize on these tools, and the new devices that arrive every day. Schilling and I do agree that you have to start with people who possess substantial intellect, so the conventional indicators of skill and accomplishments cannot be ignored. In addition, it’s important to find partners and team members with a high need for achievement, a passionate idealism, and faith in their ability to overcome obstacles, often seen as a level of quirkiness. We are talking here about finding and nurturing people who can literally help you change the world, because that’s what breakthrough innovation is all about. If your business and personal goals don’t measure up to that standard today, maybe your first focus should be on rethinking your own objectives. The bar for staying competitive in business keeps going up.